Sometimes life gets to be a bit too much. You know the type of days I am talking about; the ones where your to-do list never seems to get any shorter. The ones where the kids are constantly grumpy and worn out because they just need summer vacation to start now. The days when you come home and face a laundry pile that is possibly taller than you and realize you can't pack for Chicago until you wash, dry, and fold it all. Then you look in the fridge and realize there is nothing for dinner since you are trying to clear it out before you go away. Those are the days when you need to pick up a book by Miss Read and sink into the world of Fairacre. 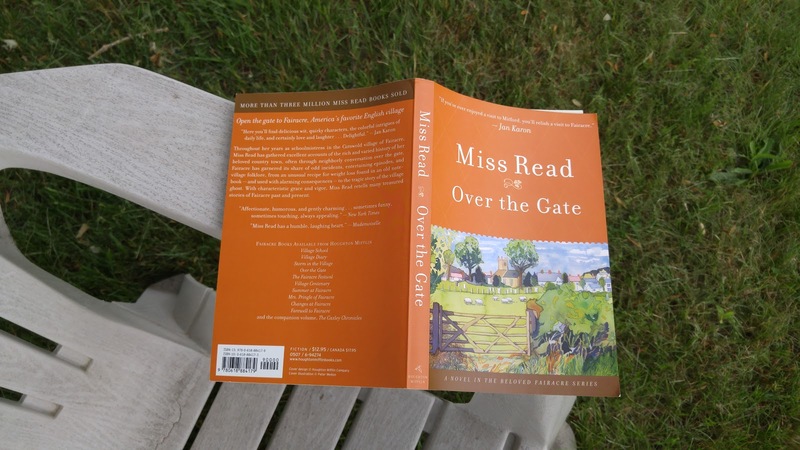 Miss Read is the pen name of Dora Jessie Saint. She wrote two series of books, one set in Fairacre and one set in Thrush Green. Her books are gentle but with a realistic bite to them. She was a wonderful observer of nature and her books contain some beautiful descriptions of the English countryside. The Fairacre books revolve around Miss Read herself and her job as schoolmistress. Over the Gate is loosely connected by the stories of village life told to Miss Read by her neighbors. It might not be my favorite in the series but it is very enjoyable and relaxing. Here is Miss Read's description of the village. A sharp shower had left the village street glistening and the bushes and trees quivering with bright drips. Now, bathed in evening sunlight, the village sparkled. Scent rose from the wallflowers and polyanthuses in the cottage gardens, and blackbirds scolded from the plumed lilac bushes. Our village of Fairacre is no lovelier than many others. We have rats as well as roses in our back gardens, scoundrels as well as stalwarts ploughing our fields, and plenty of damp and dirt hidden behind the winsome exteriors of our older cottages. But at times it is not only home to us but heaven too; and this was just such an occasion. I enjoyed the descriptions of village school life. It is so different from the life my children experience. I know times have changed but I ended up yearning after a time where the children's happiness was important and not just whether or not they can pass a test. I know teachers work hard today too but they no longer have the freedom to take a class of restless children out into the countryside for a walk. I think we have lost something because of that. All this, of course, was what had held my class in thrall-the compelling imperious spell of spring. Of what use were the frieze, the crayoned sun, the poster, the laden nature table and the captive frogs' spawn? They were no substitutes for the real thing that exploded all around them....We made our way slowly up the sunny slopes of the downs before throwing ourselves down on to the dry springy turf in order to revel to the full in the glory of a warm spring day. Below us spread the village like some pictorial map. The trees were misted with young leaves, and here and there a flurry of white blossom lit up a garden. I thought of our poem left neglected, but felt no regret. Let us savour this now, and then come to Robert Bridges' poem, 'recollecting it in tranquillity,' was my feeling.